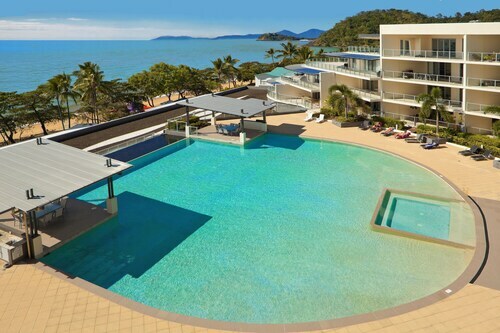 Situated near the airport, this luxury apartment building is 0.6 mi (1 km) from Kewarra Beach and within 6 mi (10 km) of Palm Cove Beach and Clifton Beach. Skyrail Rainforest Cableway and Tjapukai Cultural Park are also within 6 mi (10 km). Within easy reach of Kewarra Beach, Clifton Beach, and Half Moon Bay Golf Course, this Trinity Beach apartment building is located by the sea and set on the beach. Local attractions also include Clifton Village Shopping Centre and Yorkeys Knob Beach. Located in the heart of Trinity Beach, this apartment building is 0.6 mi (1 km) from Kewarra Beach and within 6 mi (10 km) of Palm Cove Beach and Clifton Beach. Skyrail Rainforest Cableway and Tjapukai Cultural Park are also within 6 mi (10 km). 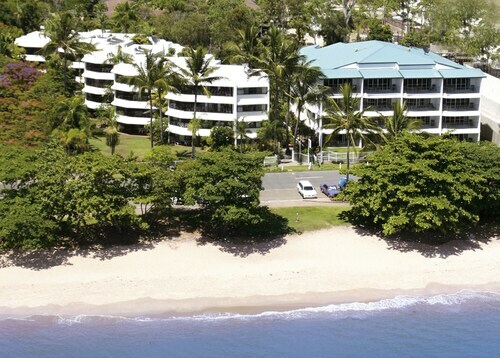 This Trinity Beach hotel is on the beach, 0.3 mi (0.6 km) from Kewarra Beach, and within 6 mi (10 km) of Palm Cove Beach and Clifton Beach. Cattana Wetlands and Skyrail Rainforest Cableway are also within 6 mi (10 km). Located in Trinity Beach, this beachfront apartment building is on the boardwalk, 0.7 mi (1.1 km) from Kewarra Beach, and within 6 mi (10 km) of Palm Cove Beach and Clifton Beach. Cattana Wetlands and Skyrail Rainforest Cableway are also within 6 mi (10 km). Located in Trinity Beach, this beachfront apartment building is on the boardwalk, 0.7 mi (1 km) from Kewarra Beach, and within 6 mi (10 km) of Palm Cove Beach and Clifton Beach. Cattana Wetlands and Skyrail Rainforest Cableway are also within 6 mi (10 km). 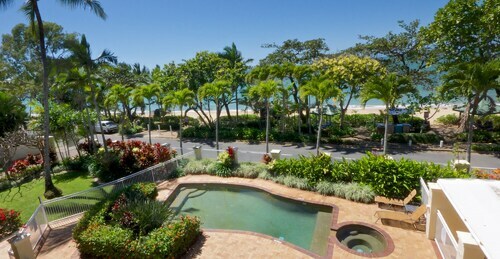 Offering direct access to the beach, this Trinity Beach apartment building is 0.4 mi (0.6 km) from Kewarra Beach and within 6 mi (10 km) of Palm Cove Beach and Clifton Beach. Cattana Wetlands and Skyrail Rainforest Cableway are also within 6 mi (10 km). 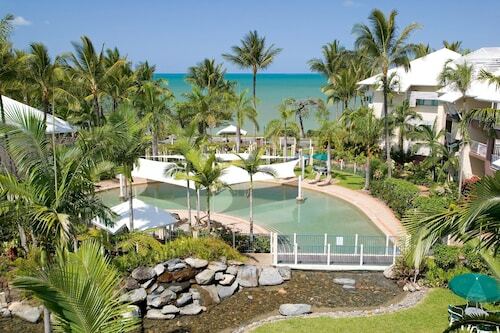 Planning a trip to Tropical North Queensland? Looking for a place to crash near where all the action is? You'll find 45 listed options within a radius of 5-kilometre. The Vue Apartments Trinity Beach and the Kewarra Beach Resort & Spa are the most centrally located hotels in Trinity Beach. Wotif also offers the Bellevue At Trinity Beach and the Sea Change Beachfront Apartments. It would be good to think about finding a place in the popular neighbourhood of Northern Beaches. It has 57 hotels and is found just 2 kilometres from the city center! 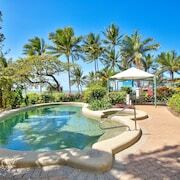 Island Views and Alamanda Palm Cove by Lancemore are some good examples of the options here. You can opt to stay near to the Skyrail Rainforest Cableway. Check out On the Beach Holiday Apartments. It's just a short drive away. Grab your best 5-iron and make your way to the well-maintained hills of Half Moon Bay Golf Course. If you want to see this attraction and would like to spend a night or two nearby, take a look at Coral Sands Resort and Roydon Beachfront Apartments. Blackout Sportfishing is a fabulous space for newcomers and frequent visitors to experience some water-based sports. Stay at Beachfront Apartments on Trinity Beach and Paradise Palms and you can stop by this site as often as you'd like. If you find yourself needing more options in Trinity Beach, consider the Port Douglas Valley Retreat and the Edge Apartments Cairns. They are located 35 kilometres and 14 kilometres away from the city's main streets. Further alternatives are the Waters Edge Apartments Cairns, 16 kilometres away, and the Vision Apartments, 16 kilometres. The nearby cities of Speewah and Cairns are certainly worth going to. Speewah is 13 kilometres to the southwest of Trinity Beach, while Cairns is 17 kilometres to the southeast. Speewah hotels and apartments are the Cedar Park Rainforest Resort and Speewah Country Tavern. 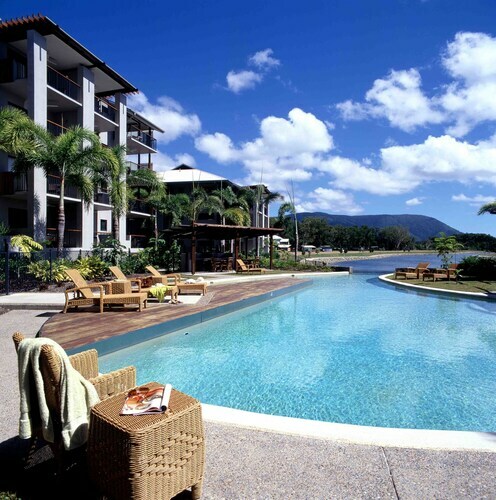 Cairns choices include the Piermonde Apartments - Cairns and Cairns Luxury Apartments. Cairns International Airport is the most practical airport, and is located 11 kilometres away from the centre of Trinity Beach. Hotels close to Cairns International Airport are the Shangri-La Hotel, The Marina and the 181 The Esplanade. How Much is a Hotel Room in Trinity Beach? 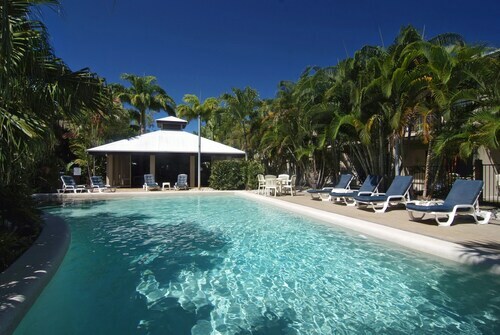 Hotels in Trinity Beach start at AU$126 per night. Prices and availability subject to change. Additional terms may apply.